Testoxyl Propionate is used less than Testoxyl Enanthate and Testoxyl Cypionate. The main difference between these two is the duration in the body of the athlete. Testoxyl Propionate acts after injection about two days and two weeks for Enanthate. Testoxyl Propionate is a strong androgen, like any other testosterone and is well suited for a set of muscle mass and power indicators. It begins to work very quickly, the next day after the injection, an athlete can feel better appetite, cheerfulness, pumping. Who has not at hand Sustaxyl and they want as much as possible to start the cycle faster, can experience Testoxyl Propionate to start a cycle with Testoxyl Enanthate. Put 100 mg of Testoxyl Propionate and 500 mg of Enanthate, after one day another 100 mg of Testoxyl Propionate. Then already will act Testoxyl Enanthate and from Testoxyl Propionate can be abolished. 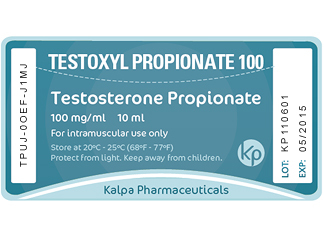 Unlike other testosterone, Testoxyl Propionate less water accumulates in the athlete’s body and is therefore used to build quality muscle mass. For this purpose is suitable a combination of 100 mg Testoxyl Propionate through the day and 40-50 mg of Dianoxyl per day. It is possible to change Dianoxyl with Turanaxyl. But still it must be noted that in the process of bulking it would be better to change Testoxyl Propionate with Sustaxyl as to inject Sustaxyl once a week is much easier than Testoxyl Propionate every day or every other day. In case of high flavoring of Sustaxyl, you can always use antiestrogens. From the above it becomes clear that the main purpose of Testoxyl Propionate in bodybuilding is to prepare for the competition, also women athletes do not use it so often. Like other steroids, Testoxyl Propionate is used to maintain muscle mass during the lack of calories in the diet of an athlete. Testoxyl Propionate as well as Trenboxyl, Masteroxyl, Stanoxyl, Oxandroxyl are perfect at this step of preparation, since it helps to keep the muscle mass and not gain excess water. The combination of 100 mg of Testoxyl Propionate, 75 mg of Trenboxyl Acetate and 50 mg of Stanoxyl every day or every other day will bring excellent results. Women prefer Testoxyl Propionate than other testosterone, because when used it is less likely side effects from androgenic effects. Girls are using 50 mg of Testoxyl Propionate every 3-5 days and achieve good results. Higher dosages and frequent injections of course seriously can improve the results, but there is a risk of androgenic side effects. Testoxyl Propionate cycle is not desirable to make more than 10 weeks, Testoxyl Propionate androgenic effect helps the athlete to recover faster and to accelerate the synthesis of protein, it is recommended to add some anabolics: Nandroxyl, Oxandroxyl, Stanoxyl. User who are not yet ready to use, such as Testoxyl Enanthate, for fear of side effects, may try to start Testoxyl Propionate. Side effects when using Testoxyl Propionate appear less frequently, as the dosage it will be smaller and less active ingredient goes into the sludge as it was used for other purposes. Applying Testoxyl Propionate at least once every two days is not effective. There are those who put every 3 days, but at the same time increase the dosage, and so it is better to go with Sustaxyl, if you still do not like frequent injections. This method of use will be less effective, since there will be large fluctuations in testosterone levels and it will lead to additional side effects. Testoxyl Propionate dosage is 50-100 mg every day or every other day. Side effects from Testoxyl Propionate are the same as the other testosterones, but occur less frequently. decrease in own production of testosterone.